A scientifically formulated, long lasting, extreme pressure lubricant which operates under the most severe pressure and abrasive conditions. This product is developed as industrial Chain Lubricant but is also suitable for a numerous of other applications. It contains Bardahl’s famous “Polar attraction” formula to reduce friction. Many chains are open to the air, this increases their contact with water and dampness and encourages corrosion. It also means more chance of fouling with dust, sand, road grime and the like. Corrosion and dirt hinder chain movement and lead to excess wear. In addition, some chains – conveyor and drive chains – have intricate links with tight, hard-to-reach spaces. Regular lubricants don’t penetrate these spaces easily and eventually tend to squeeze out. 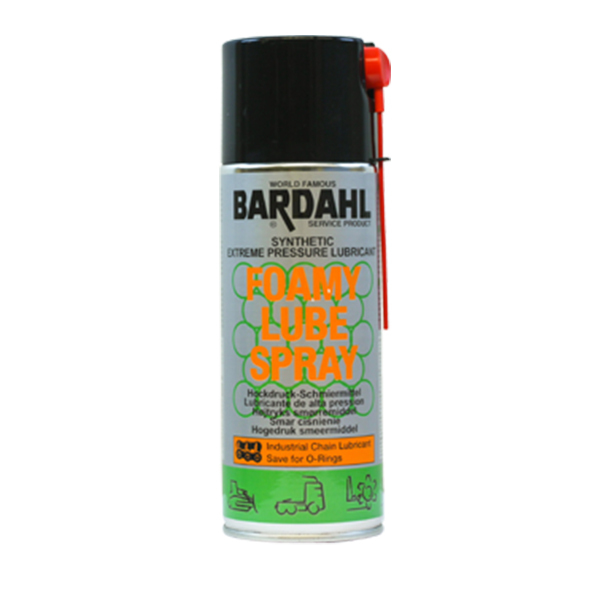 The action: Bardahl Foamy Lube Spray contains a penetrating property, Bardahl’s “Polar attraction” formula, an anti-oxidant, and a combination of high-grade oil and unique polymer for cushion lubrication. This product is safe for o-rings.